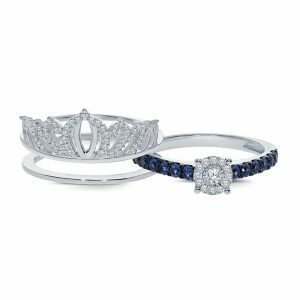 Stunning Blue Engagement Rings – In All Price Ranges! 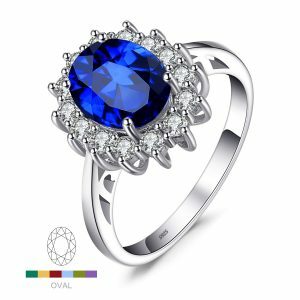 Unique engagement rings are becoming more and more popular and blue is the perfect color for a modern-day engagement ring! Blue is a color that brings calm and peace, which is exactly what you want within your marriage. It is also the color of trust and honesty which are must-haves for a solid relationship. The fact that it creates some of the most beautiful engagement rings out there is a great bonus! 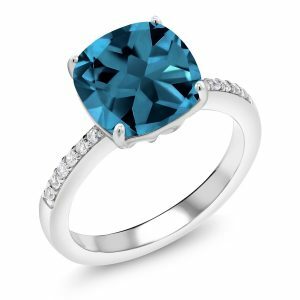 Check out these amazing 10 blue engagement rings below. We have something for everyone regardless of budget! 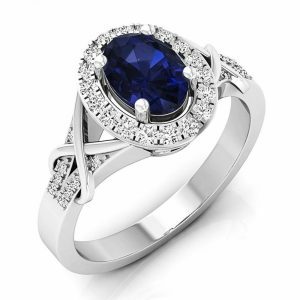 Our very first pick is this Dazzlingrock Collection sapphire and diamond ring. This falls around the middle of our picks in regards to the cost. For what it is, it is highly affordable but if you are on a tight budget, you’ll want to check out some of our more affordable picks. You get to choose it in either solid white gold or solid yellow gold. Both are beautiful options that create two very different looks with the sapphire and diamond accents. At the center, a single natural sapphire with a stunning oval cut is mounted securely. The natural stone is 1 carat for the perfect size that shows off the stone beautifully without taking over the entire finger. The natural sapphire is completely surrounded by a halo of small natural round white diamonds. The mounting prongs within the halo of natural diamonds are squared for a subtle detail that gives a very clean look to this ring. The band is a consistent width from the bottom and up most of the sides. However, once you get close to the top, the band splits into both sides and spreads out to securely hold the sapphire and halo of diamonds in place. Starting at this split and moving their way up to the halo of diamonds are rows of additional little natural diamonds. Finally, extending out from the halo, there are two thin bands of gold that swirl out and around the rows of diamonds on the band. Altogether, this optionhas a wonderfully elegant and classic look. It is available in a wide variety of sizes ranging from 4 all the way to 10. It even includes half sizes for a more customized and comfortable fit. It should be noted that the sapphire of this ring has a very deep and dark blue color. It really does have a beautiful contrast whether you choose the white gold or the yellow gold for your ring. Now here is an option that will really WOW people! This lovely, high-end ehoice from Houston Diamond Direct is the most expensive one that we chose for our list of blue engagement rings. It is of the highest quality with all-natural stones with amazing cut and clarity. This is not a ring for just any budget. It does cost a good chunk of money, but it is entirely worth it as far as value goes. 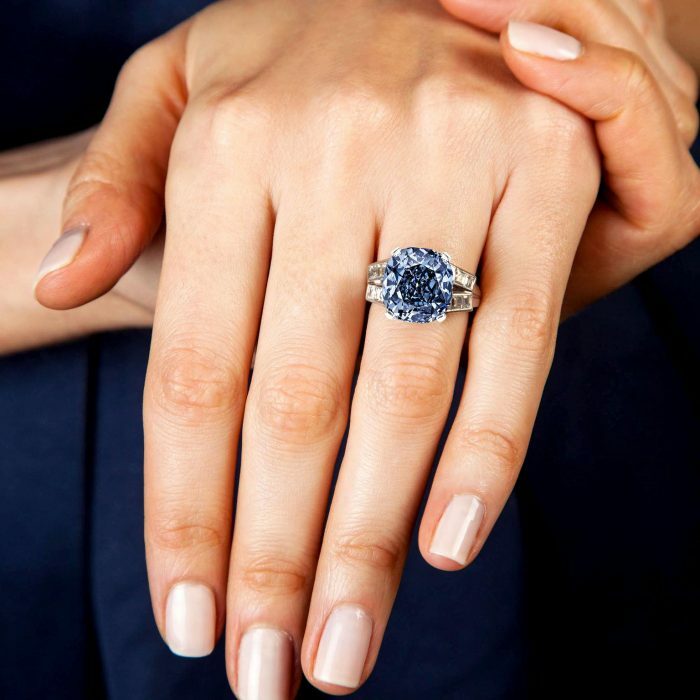 If you are after a super high-end blue engagement ring, this is the right choice for you! This ring features a large 0.75-carat natural blue sapphire at the center. The stone has a lovely multi-faceted round cut with AAA+ clarity. The blue of this sapphire is intensely bright and almost glows. It shines beautifully in nearly every light. Surrounding the amazing stone, there is a perfect halo of natural white diamonds. The diamonds of the ring also have amazing cut and clarity further raising the overall value of the piece. Tiny white gold prongs hold the little diamonds in place with perfect spacing all the way around the center stone. A thin and dainty band of white gold creates a soft and feminine look that further accentuates the natural round sapphire in the center. Down each side of the band, there are more natural white diamonds creating even more detail and adding additional value to this high-end pick. It is available in sizes 4 through 9 with half sizes being included as well. 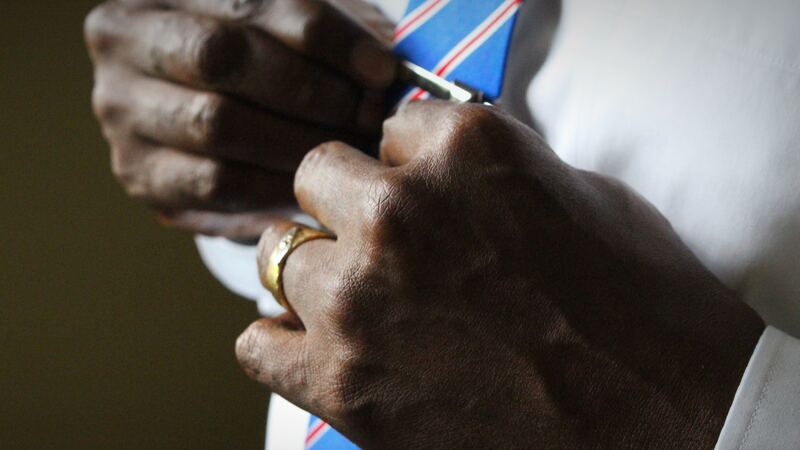 This, as well as the smooth inside section of the band, allow you to have maximum comfort while wearing it. One more cool thing to note about is that it comes with multiple options for your center stone. There are three different blue options available for the center stone pick. There is the bright blue sapphire that we have just talked about. Then there is also a shiny green-blue diamond option or even a purplish-blue tanzanite choice if you prefer either of those. Choosing a different blue stone does not dramatically affect the price of the ring. Here is another great choice from Dazzlingrock with a classic and timeless design that never goes out of style. This 14k white gold option has a soft and feminine look perfect for a lady’s engagement ring. It features natural diamonds in a mixture of white and blue stones. The main stones of the setting are 3 decently sized round blue diamonds with the largest of the three being located in the very center of the ring a bit higher than the other 2 blue diamonds. All of the diamonds feature a good cut with an incredible ability to send light sparkling back out of them. Gold prongs hold the stones securely at the center of the thinner gold band. Much smaller natural round white diamonds decorate the sides of the band as well as the prongs on the front and back of the ring that mount the blue diamonds into place. Since this ring is made of solid 14k white gold and all-natural white and blue diamonds, you can definitely expect to spend more on it. It isn’t our priciest pick, but it isn’t too far from it. This is definitely a very nice choice of high-end blue rings. 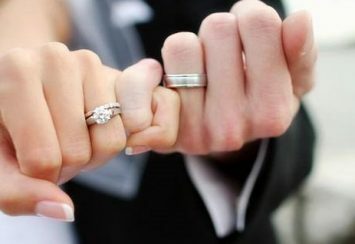 The ring comes in a variety of women’s sizes ranging from 5 to 9 and including all whole and half sizes within that range. 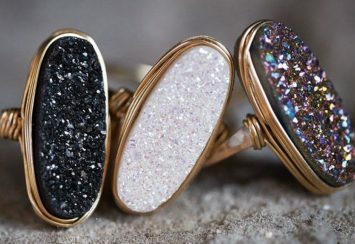 Dazzlingrock works hard to provide the highest quality jewelry choices available and you can count on the fact that they’ve done that with this ring as well. 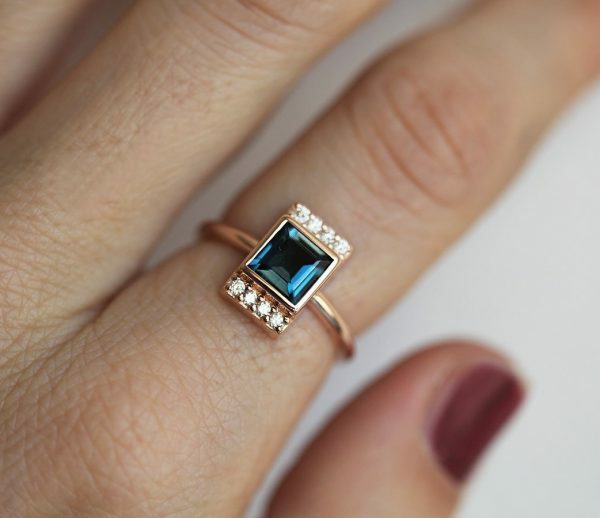 The Peora London blue topaz ring is the perfect pick if you’re on a tighter budget, but you still love your bling. London blue topaz is brilliantly gorgeous and actually looks very similar to natural blue diamonds. However, it is much more affordable than diamonds! It features a huge London blue topaz stone that measures in at 2.25 carats! Even with this huge real topaz stone, the cost of the ring is just a tiny fraction of our picks that include things like natural blue diamonds. The topaz, similar to blue diamonds, is a cooler shade of blue than sapphires with just a slightly more opaque look. It goes very well with the solid sterling silver of this ring. The stone measures at 8mm in diameter for an eye-catching size that will get you tons of compliments. The 925 sterling silver that makes up the base and band is also plated with rhodium. The rhodium plating gives the silver an even better shine with superior durability and strength. On the sides of the ring, there are multiple cubic zirconia stones with excellent cut and clarity that allow them to sparkle almost just like real diamonds. The cubic zirconia stones are inlaid into the center of the band down the sides. On each side of these inlays, there are raised sections of silver that bend up and become the prongs that hold the topaz stone in place at the center top. Sizes 5 through 9 are available. All in all, this is a great budget choice for someone that fancies a slightly unique look with a great blue stone option. 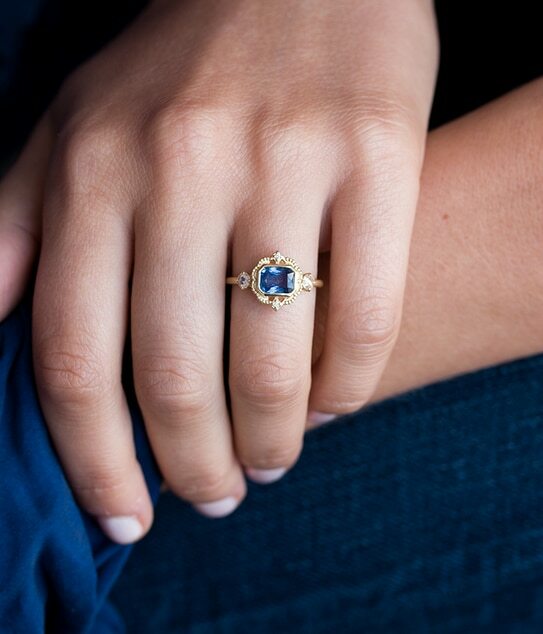 A favorite of ours is this Gem Stone King is this mesmerizingly beautiful two-tone gold and sapphire ring! This amazing piece sophistication and elegance. It isn’t cheap by any means, but it is a fairly low price for being made of genuine natural materials. The band is made from solid 10k yellow gold. It is fairly thin but very solid still. It stays a consistent width all the way around the finger for a smooth and simple look. At the top of the band, there is a lovely 10k white gold base where an absolutely dazzling natural sapphire is mounted with matching white gold prongs. This natural stone is an impressive 2.5 carats, so it is sure to draw lots of attention and following compliments. The multi-faceted oval cut shines brilliantly. Completely surrounding the oval-cut sapphire are small natural white diamonds. The white gold prongs that hold these little natural diamonds in place are carefully created to match each other wonderfully for a clean-cut and high-quality look. 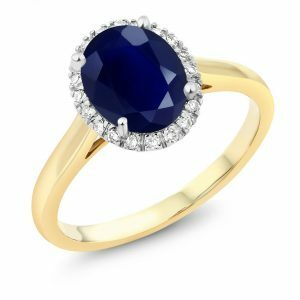 Considering that it features a large natural sapphire, a halo of beautiful natural diamonds, and a two-tone solid gold design, it is actually very affordable. It isn’t nearly as inexpensive as some of the options on the list that are made of somewhat lesser quality materials, but when it comes to engagement rings and the high quality you’re getting, this is actually a great deal from Gem Stone King. It also comes with the Gem Stone King lifetime guarantee. They guarantee all of their pieces against damage from normal wear and tear. It can be purchased in sizes 5 through 9. It is the ideal choice if your biggest goal is an elegant and timeless design with a unique touch. Another lovely choice from Gem Stone King for a great blue engagement ring on a slightly tighter budget is this gorgeous London blue topaz option. The band of this ring is a thinner option with a sweet and dainty appearance. This is contrasted by the large topaz stone set in the center of the band. This natural stone is quite large at 4.47 carats. The stone has a really cute cushion-cut that gives it a sweet shape and tons of shine. Lining the top and sides of the band beyond the stone, there are small cubic zirconia stones inlaid. The band itself is made of 925 sterling silver for strength and beauty on a budget. Topaz is a great choice of stone for a less expensive engagement ring. It isn’t just beautiful and inexpensive, but it is actually even thought to have healing properties by some – not just physical healing but mental healing as well. With the look of blue diamonds, the cost of cubic zirconia, and some cool lore, topaz make a really great natural stone choice for many. 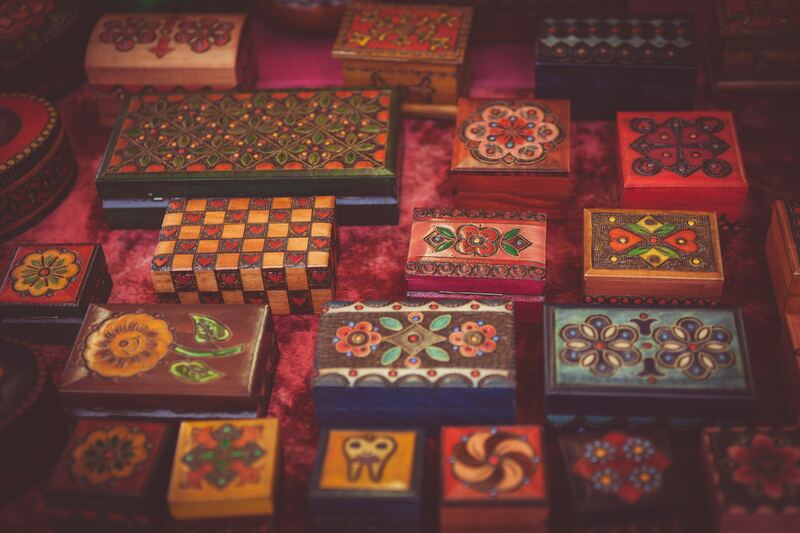 It comes in sizes 5 through 9 and even comes in a nice ring box that makes gift-giving (or proposing) even simpler! La4Ve Diamonds creates some of the most stunning, high-quality pieces of genuine jewelry at very reasonable prices. 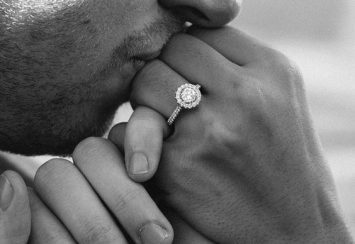 Now, considering what this amazing engagement ring is made out of, it’s understandable that it is relatively expensive compared to many of our options. Even so, the all-natural, genuine materials make it very worthwhile and mean that this is a piece that you can count on for life – which is important considering the commitment you’re making with an engagement jewelry option! It is definitely a great option if you’re aiming for high-class. 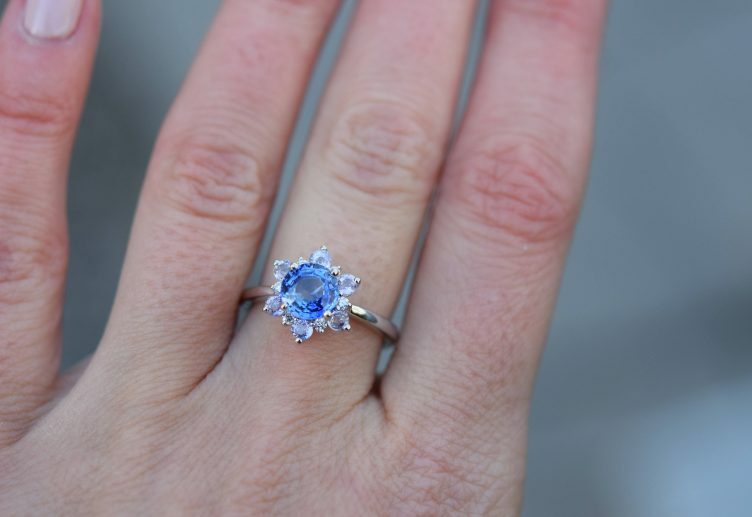 It has a very elegant and classic design that holds tight to tradition with just a hint of unique beauty thanks to the blue sapphire additions. The band is solid 14k white gold that holds the stones of the ring wonderfully. The main stone at the center is a real natural white diamond with a perfect princess-cut. It is held securely in place by carefully shaped white gold prongs on each corner. On each side of this main princess-cut diamond, there is a stunning princess-cut natural blue sapphire. These 2 blue stones are just a little smaller than the larger center-mounted diamond. They accentuate the diamond perfectly and add just the right amount of bright color to this otherwise very classic piece. They are also both mounted with the carefully placed white gold prongs. Then, on each side of the sapphires, there are additional, smaller natural white diamonds that are actually inlaid into the white gold band itself. There are four of these smaller diamonds on each side of the ring for a total of eight small white diamonds. They all feature the same perfect princess-cut of the main stones of the ring. This allows them to sit flush against each other in a stunning row across the white gold band, which features the same width all the way around. This lovely, genuine option is available in sizes as small as 4.5 and ranging up to 9. 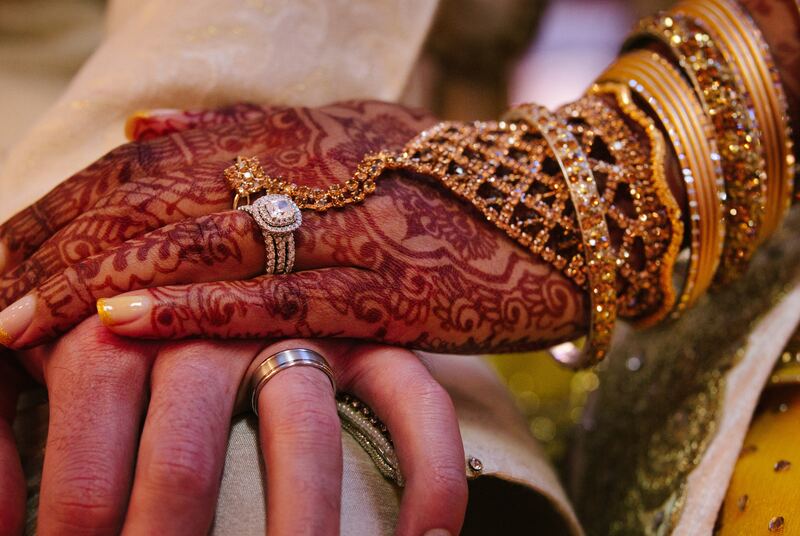 If you are wanting to go mostly traditional with just a little extra something special, this is the ideal choice of ring for your engagement! Now, here is an option that is anything but traditional. This amazingly unique piece features a darker look that can match styles ranging from quirky to sophisticated. 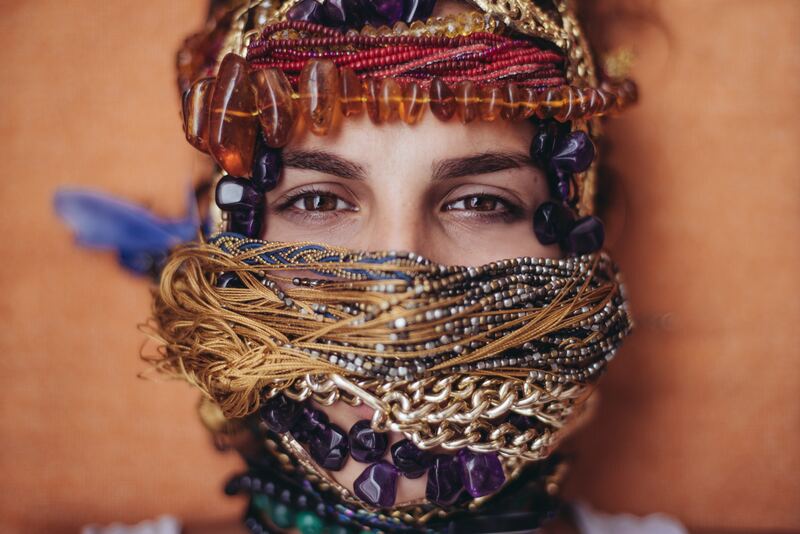 It is all about how you choose to wear it, but however you wear it, it is entirely different than almost anything else out there. It also comes at an incredibly low price. This is mostly because the ring features a created sapphire and cubic zirconia as opposed to natural stones. While this does mean the quality is a bit lower, it still makes for a truly beautiful ring that looks almost just like the real stuff. Plus, the price is really hard to beat if you are on a tight budget or you just want to put your money to use elsewhere – like your honeymoon! The base metal is durable 925 sterling silver. Then, there is a plating of gorgeous 14k black gold on it. The black gold goes so well with the lovely blue stones that adorn all sides of the ring. At the bottom the band starts as one solid piece. Then, as it goes up the sides, it splits on each side and then the two separate pieces curve out and then back in until they cross each other. Then they go straight up so that each of the pieces of the band becomes a prong for the setting of the main stone. 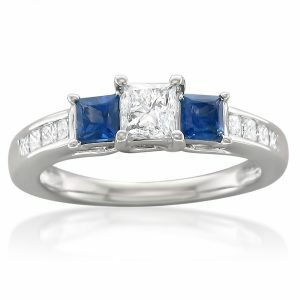 All along each of the 4 separate pieces of the band, there are rows of lovely little blue cubic zirconia stones inlaid. Black gold prongs hold them perfectly in place along the bands. The main stone is an impressive 2.0-carat created blue sapphire. It looks just like natural sapphire with a very bright and deep shade of blue. The princess-cut is accentuated wonderfully by the 4 black gold prongs that hold each corner of the stone. 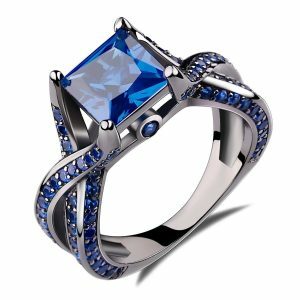 When looking at the ring straight on, you’ll see blue cubic zirconia stone that sits in a circle of black gold right below the large sapphire. It adds the perfect final detail to help bring the entire piece together. Itcis available in a decent range of sizes from 5 to 11, so it will fit even women with larger fingers. If you are looking for something with a very distinctive look, this is it! Inexpensive materials that are still exquisitely beautiful and relatively durable make this an extremely affordable option that could literally be purchased for almost any budget imaginable. This is perfect if you are on a super tight budget but you still want a stunning ring that will last. This ring actually has a design very similar to Kate Middleton’s engagement piece of jewelry! The band is 925 sterling silver. This is very durable and very pretty. It matches strength with beauty in the most inexpensive way possible. The large center stone is a simulated blue sapphire. It features brilliant cut and clarity that make it shine just like a high-quality natural sapphire. 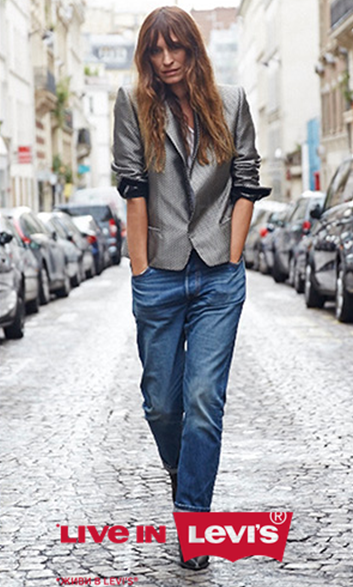 The bright blue color attracts attention perfectly for a fun and unique style. The oval-cut provides a classic touch that is complimented quite well by the marvelous halo of cubic zirconia stones that surround the grmstone. The halo is made up of 14 individual stones that all have great cut and clarity that shines brilliantly alongside the large center sapphire. One of the details that makes it such an incredible choice of budget ring is the prong settings. They are very carefully set to keep it looking clean and neat, which is something that cheaper rings often lose out on. Each one of the prongs is smooth and straight matching all the others ideally. One more cool detail that you’ll enjoy is that when you look straight at it, you see lovely silver details that peak out from underneath the sapphire! Choose this great ring in any size from 5 to 10! Turn your princess into a queen with this endearing choice of the crown insert engagement ring from La Joya. This option isn’t super cheap, but it is very affordable as far as engagement rings go. This engagement ring is actually a set of two rings! It comes with the actual ring itself as well as a secondary piece that your ring slides into to create an even more beautiful and detailed look. The base is made from solid 925 sterling silver for durability, beauty, and affordability! The main ring of this set is made with a thin and dainty band that keeps it a good size to slide into the other section. At the very center, a precious natural white diamond sits inside a halo of tiny natural diamonds. Textured sterling silver around the main diamond inside the halo of smaller diamonds actually serves to give the stone an even larger look. Along the band on each side of the diamonds, there are small blue sapphires. Underneath the sapphires on top of the silver of the band, there is a layer of black gold that comes up to create the mounting prongs that hold the sapphires in place on it. This gives a great compliment to the blue color of the sapphires and gives even more contrast between the base of the ring and the center diamonds. This entire piece then slides into a larger piece that gives the set its darling crown appearance. This section includes rows of curling silver details that are completely adorned with more of the little diamonds. Coming in sizes 6, 7, and 8, this ring has an unbeatable sparkle for a relatively affordable price. 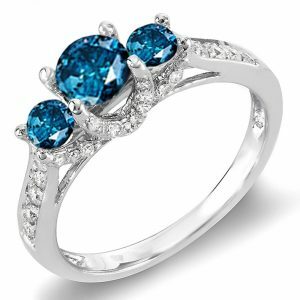 There are several different blue stones that you are likely to find in a blue engagement ring. The cool part is that each type of blue stone has a special and unique meaning. 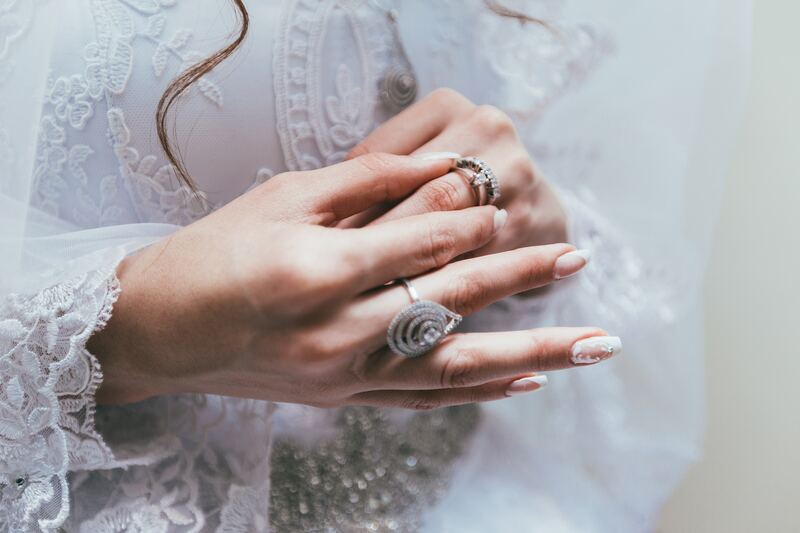 This isn’t just neat to know but can even help you find the perfect engagement ring stone choice for what your ring and engagement mean to you! Blue diamonds are one of the rarest forms of diamonds out there. They are a very special stone that holds a lot of meaning, especially when given as a gift to someone of great importance in your life. Appropriately for an engagement ring, blue diamonds are often seen to symbolize eternity and devotion. In a jewelry piece, this helps show your eternal devotion to your soon-to-be spouse. They also represent peace, calm, and truth. All of these are some of the most important building blocks for a solid marriage. Blue topaz looks very similar to blue diamonds but comes at a small fraction of the cost. It makes a very special ring choice as well due to its romantic symbolism. 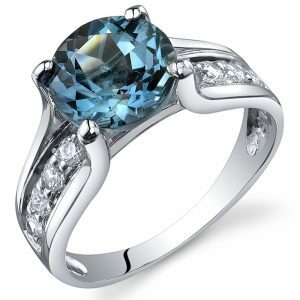 Blue topaz represents everlasting romance as well as exceptionally strong friendship. For many, your spouse is your best friend and blue topaz is the perfect way to show that. Truthfulness and understanding one’s feelings are also important things associated with blue topaz that can go along perfectly with an enduring relationship! 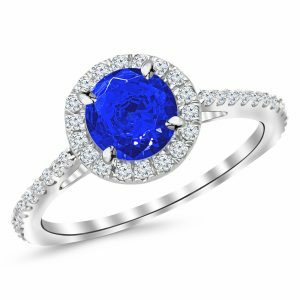 Probably the most common choice of blue stone for engagement rings, blue sapphire is stunning and versatile with deeper hues of blue than diamonds or topaz. Sapphires have often been considered jewels of royalty that give the wearer good fortune. They are meant to preserve honesty and promote peacefulness. If you consider your girl your queen, this is a great way to show her and also start your marriage off right with honest intentions. It is also a stone of joy and fulfillment which are exactly what you want to gain and provide for your new spouse in your marriage!